FOMS President Colin Harris and FOMS members Alan Williams and Bruce Gotch with four of the newly installed signs. 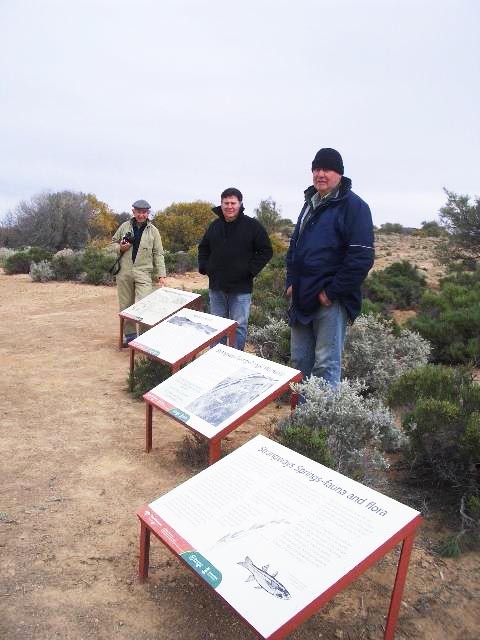 Visitors to Strangways Springs on the Oodnadatta Track will come away with an improved understanding of the site’s historical, cultural and ecological significance after six new interpretive signage panels were installed in July. The new signs were installed by FOMS volunteers during the field trip of July 2014. The result of a partnership between the volunteer group Friends of Mound Springs (FOMS), the Arabana people and the SA Government, the new signs replace their aging and badly faded predecessors to tell the stories of the Overland Telegraph and the mound springs. FOMS members revised and updated the signage text while Natural Resources SA Arid Lands worked with Aaron Stuart, then Chair of the Arabana Aboriginal Corporation, to ensure the wording appropriately reflected the Arabana community’s traditional and ongoing association with the site. The new signs were installed by FOMS members Bruce Gotch and Alan Williams on a bitterly cold July day when maximum temperatures over the inland struggled to reach double figures. The new replacement panels were funded by Natural Resources SA Arid Lands and it is hoped that they will remain serviceable for the next six to eight years. 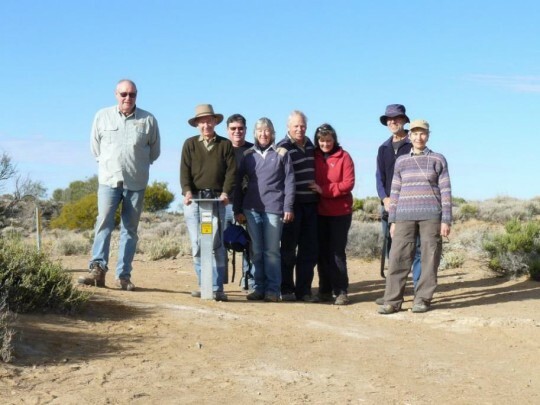 FOMS and Natural Resources SA Arid Lands would also like to acknowledge S Kidman & Co for the considerable funding and effort they invested in the 1990s to fence the mound springs and the ruins of the repeater station. Eight members of Friends of Mound Springs (FOMS) participated in a trip to the Far North in late July 2014. Those in the party were Colin Harris, Bruce Gotch, Alan Williams, Bernice Cohen, Margie Barnett, Brendan Lay, Elizabeth Lay and Simon Lewis. 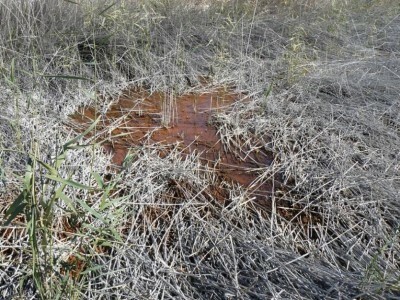 The main purpose of the trip was to gather information at a number of mound springs on the Peake Pastoral Lease, linking with the major investigation being coordinated by the Department of Environment, Water and Natural Resources (DEWNR) and focussing on the development of clearer management prescriptions for many of South Australia’s mound springs. This three year project has major funding through the Australian Government’s Caring for our Country program, with FOMS and others supporting DEWNR in the work. A supplementary purpose of the trip was to install new interpretive signage at Strangways Springs – see separate item in this newsletter. With the latter task in mind, Colin, Bruce, Alan and Bernice commenced their trip on Friday 18 July, collecting the new signs from DEWNR Port Augusta and reaching Strangways Springs by evening. They then spent Saturday installing the new signs and also checking the Springs Walk, one of two walks established by FOMS in 2011. The Springs Walk was in good shape, although it is clear that most visitors are walking to the cemetery and back rather than doing the whole circuit. For Margie, Brendan, Elizabeth and Simon the FOMS trip commenced on Saturday 19 July, rendezvousing at Roxby Downs and travelling on to Strangways to join the rest of the party. A cold night ensued but fortunately the firewood supply was adequate. Before leaving Strangways, the group did a lap of the Wool-wash Walk, the second of the trails installed by FOMS in 2011. Again the trail was in good shape, although apparently subject to limited use. Then it was on to William Creek for fuel and morning tea. From there the group left the Oodnadatta Track and journeyed north on station tracks to our main camp-site on Bulldog Creek. The main business of the trip commenced at Outside Spring. FOMS member and DEWNR scientific officer Travis Gotch had prepared data sheets for use by the group, covering parameters such as vegetation species present in spring vents and tails, percentage cover of each species, level of disturbance by stock and other influences and water quality. Bruce and Alan took on the water quality monitoring role, measuring, pH, conductivity, temperature and total dissolved salts (TDS) with the field laboratory recently transferred to FOMS by the Friends of Simpson Desert group, while the others focussed on vegetation and disturbance measurement. Outside Spring proved to be very interesting. Within the area fenced in the mid 1980’s, Phragmites has been dominant for many years, but we have, over the last two to three years, noticed significant die-back of Phragmites in the centre of the vent. This die-back was even more pronounced on this trip with very little regrowth occurring. It seems reasonable to conclude that a new vegetation balance is developing at Outside Spring. In terms of management, this spring may be one to leave alone and monitor to see if the trend continues. The group also surveyed two unfenced vents and tails at Outside Spring, both of which provided an interesting comparison with the fenced spring. The group then moved on to Twelve Mile Spring, also fenced since the mid 1980’s. This is an interesting spring with several vents supporting, predominantly, Typha (bulrush) in the top vent and a mixture of Phragmites and the sedge Cyperus gymnocaulos at several other vents. There is also evidence of vertical leakage supporting Phragmites. Twelve Mile Spring was subject to stock intrusion in early 2013 through a faulty section of fence (repaired in mid-2013 by Peake manager Nathan Keogh). Vegetation damage and pugging of spring vents from this incursion was still evident. The fenced area at Twelve Mile is quite complex in terms of vents and vegetation and further thought will be needed to determine whether some form of management trial could or should be implemented. The final inspection for Monday 21st was the Fountain Spring. Like Outside, this spring has become dominated by Phragmites since fencing in the 1980’s and, also like Outside, there is now evidence of die-back of Phragmites in the main vent. Just as for Outside Spring, a thick mat of Phragmites rhizomes remains which, presumably, may take many years to break down. Physical removal of portion of this rhizomatous mat at one location may be worth considering to see what effect this has. After another cold night the group split into two for the day’s activities. Colin and Alan headed north to the Peake Overland Telegraph Station heritage site to check the walking trails and top up the FOMS brochure supply. As for Strangways, they found the walking trails to be in good shape. Both of the Peake walking trails appear to be popular with visitors. The remainder of the group travelled south to Hawker Springs, via a stop-over at Levi Springs. At Levi, we looked at the spring nearest the track and rock formations and concluded that it could be of interest to fence this spring and monitor the outcome. The spring has no mound and presumably would not be particularly difficult to fence. Currently it appears to be free of Phragmites. Alternative watering points (other springs and a bore) are nearby. Hawker Springs comprises a large group of around 100 spring vents. The group is unfenced, is roughly circular and we were interested to test the hypothesis that outer spring vents would be more affected by cattle than springs further into the group. The aim was to look at springs on the outer edge of the group and some towards the centre of the group. 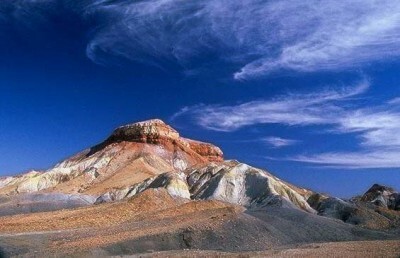 The difficult terrain meant that we would only access a small sample of the springs. Our observations tended to support the hypothesis. Outer springs were more significantly pugged and grazed than springs further into the group. Of particular interest was an extensive, apparently spring-fed watercourse towards the centre of Hawker Springs, with some Phragmites but also a lot of open water. The vegetation of the springs was quite varied, some springs with mainly Phragmites, others with Cyperus gymnocaulos and others with other sedges such as Juncus. After a warmer but slightly drizzly night, Simon headed south to catch a plane home from Olympic Dam. The remainder of the group continued to survey springs on the Peake lease – the Vaughan Spring, Fanny Springs and Big Perry. The Vaughan has been a useful comparison for many years as it is an unfenced spring quite close to the fenced Outside and Twelve Mile springs. Big Perry has been fenced since the late 1980s. Although the fence was rabbit-proofed originally, the colony inside the fence was not eliminated at the time and in any case the netting has not been maintained to a rabbit proof standard. It is not clear what impact the rabbits are having on the vegetation. The spring is dominated by Phragmites, while the tail is dominated by Typha. There is no flow at the spring vent. However, there is seepage or very low flow visible in the tail. Overall, the flow at Big Perry appeared to have diminished significantly since the previous inspection about two years ago. Because the spring has been fenced, there is no evidence of recent stock grazing or pugging, but there is some evidence of past stock impact. Seven springs were also visited in the Fanny Springs cluster. All are unfenced and heavily impacted by current cattle grazing pressure. In some cases, the travertine spring structure is collapsing –a natural process, but most certainly being accelerated by cattle. Dominant species are Cyperus gymnocaulus, Typha and Cyperus laevigatus. One spring is dominated by a ‘bonsai’ form of Phragmites. The final spring visited was the Vaughan, an unfenced spring subject to heavy grazing pressure. The two vents were dominated by Typha, with greater diversity in the tails, mainly Cyperus laevigatus in the tail of vent No. 1 and Cyperus gymnocaulus in the tail of vent No. 2. Cattle impacts were moderate to high. The return to camp provided some surprises, strong winds throughout the day having blown many items around and damaged two of the tents. The Wednesday surveys marked the end of the scheduled spring work for this trip. The group decamped from the Bulldog Creek site and journeyed back to William Creek. Then on to Coward Springs Camp-ground for a courtesy visit to Greg and Prue before moving on to the Borefield Road turn-off at Bopeechie. At that point Brendan, Elizabeth and Margie continued on to Arkaroola via Marree, while Colin, Bernice, Bruce and Alan headed south via Roxby Downs, Bruce and Alan completing the long haul back that day while Colin and Bernice broke the return trip with a night at the Eldo Hotel in Woomera. All in all, a very successful trip – very convivial group, good weather (for the most part) and scheduled work accomplished. Many thanks to all involved for their contributions! In our previous newsletter (Spring 2013) we reported on a major project to examine options for improved management of South Australia’s mound springs. 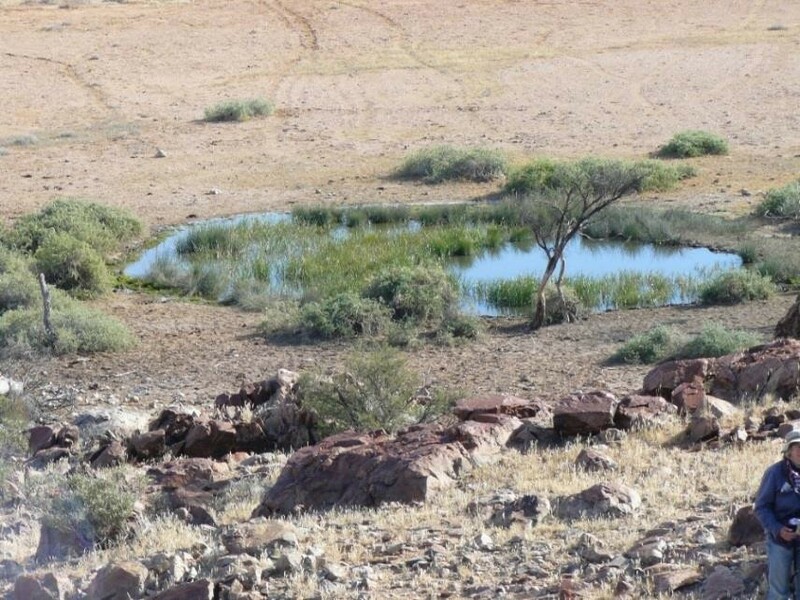 Natural Resources, SA Arid Lands has secured $1m through the Australian Government’s Caring for our Country Investment program for the project. 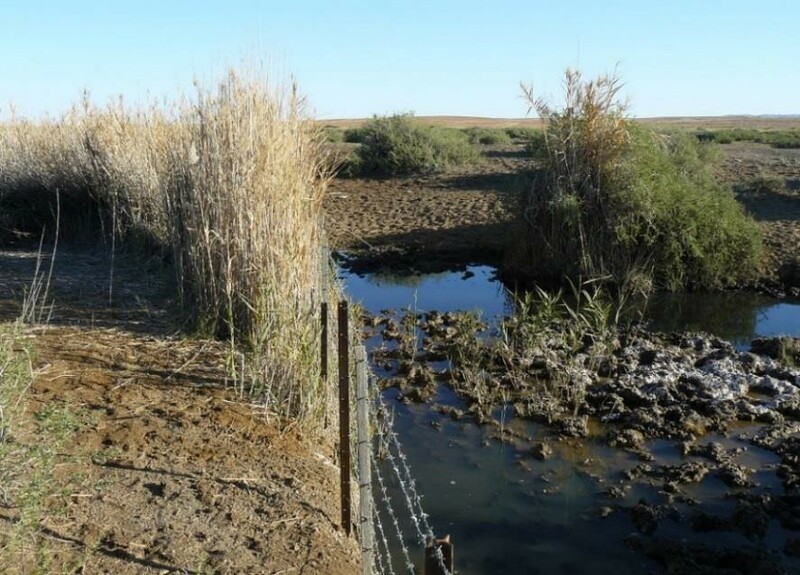 This three-year project, described as the Desert Jewels Project, is investigating, amongst other things, improved grazing management of springs, management of reeds (especially Phragmites) that have proliferated at some fenced springs, weed management (e.g. date palms and polypogon at Dalhousie) and fire management. The funding application was developed in close consultation with the Friends of Mound Springs. The Friends group developed a project brief which has been incorporated into the much larger Board application. A Desert Jewels Project Officer (Sam Gitahi) has been appointed to work full-time on the project under the direction of Travis Gotch. In addition, an Arabana Springs Cultural Officer (Shannon (Sam) Stuart) has been appointed to help coordinate the involvement of Arabana people in the project at springs of interest to the Arabana. Both Sam Gitahi and Sam Stuart commenced work in October 2014. A national Mound Springs Data Base is being developed. Fish surveys have been undertaken at Dalhousie and potential burn sites have been identified. A remote sensing project is also to be undertaken at Dalhousie – reviewing remote sensing data from the last 20 to 30 years to assess changes in open water habitat. As reported elsewhere in this newsletter, the FOMS trip of July 2014 gathered data at a number of mound springs (Outside, Twelve Mile, Fountain, Big Perry, Hawker and Fanny Springs), with observations also at Levi Springs. FOMS members Brendan Lay and Simon Lewis have also met with S Kidman and Co’s General Manager Greg Campbell prior to the FOMS trip to discuss the project. A major area of concern in mound springs management is the proliferation of reeds (Phragmites) in springs that were formerly open to grazing but have since been protected. 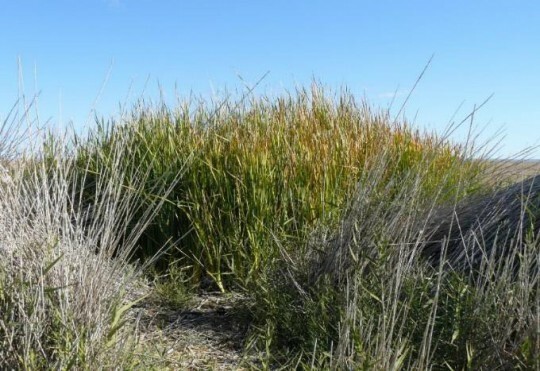 Measurements and observations by researchers and by FOMS personnel suggest that the proliferation of Phragmites in protected springs may be linked with the increased nutrient levels introduced during decades of cattle grazing. It is also hypothesised that, with prolonged exclusion of cattle, nutrient levels will gradually diminish and Phragmites abundance may decrease. in doing so, will address the perceived negative effects linked with Phragmites proliferation at fenced springs. It is planned that management trials will be implemented to help clarify optimal management prescriptions. Observations made by FOMS members during the July 2014 field trip (see trip summary elsewhere in this newsletter) and other discussions suggest that the following management trials and related research should be considered. Outside Spring, fenced main vent. The cover of Phragmites in the vent has diminished markedly over the last few years. Outside and the Fountain would be useful trial and/or reference areas as both are showing an apparent decline in Phragmites abundance. One of these springs (e.g. Outside) could be left as a reference area, with a burning trial at the Fountain. Burning half a spring (longitudinally) is seen as a good objective, although it may be difficult to achieve. A logistical issue is that summer burning may be optimal and it may be difficult to secure a fire crew at that time, given priorities elsewhere in the State. Burning would test the theory that fire will hasten the depletion of the Phragmites rhizomes and therefore hasten the decline of Phragmites. A burning trial at Twelve Mile could also be contemplated to test this theory. Further discussion is needed to confirm the best timing for trial burns. A noteworthy occurrence at both Outside and the Fountain is the residual mat of Phragmites rhizomes in the spring vents. Even if there is very little growth of Phragmites in these areas, the rhizomatous mats could persist for many years. A trial is recommended to remove a section of this mat at Outside or the Fountain (probably the Fountain, if Outside is left as a reference). Some concerns have been raised about the proposal to remove a small section of rhizomatous mat. Those concerns focus on two aspects: (a) possible impact upon invertebrate fauna in the spring sediments; and (b) exposure of the spring sediments to air and oxygenation of sulphur compounds in the muds to form sulphuric acid, with flow-on deleterious effects. 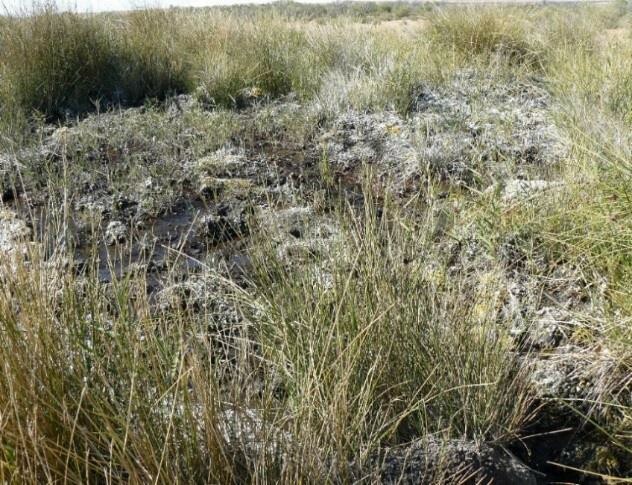 In relation to invertebrates, it is proposed that only a small proportion of the rhizome mat be removed, meaning that the bulk of the invertebrate population would not be directly disturbed and should re-colonise the area where the mat is removed. The acid-sulphate soil issue warrants further discussion but the intention would be to remove only a small section of mat in a patch where the sediments would remain submerged. This should limit the risk of acidification. Outside Springs comprise several vents, of which one is fenced. Further fencing could be contemplated at Outside to add more information about grazing exclusion in this area. At Levi Spring fencing of the spring adjacent to the track and rock outcrop would be of interest and could be easily done, as the spring has no significant tail, is on “easy ground” and is currently free of Phragmites. This relatively minor work could provide useful information about grazing impacts and cessation of those impacts. In discussion, it has been suggested that fencing of this small spring at Levi could lead to prolific growth of Phragmites. An alternative suggestion has been to fence a larger area at Levi to include other springs also. Fencing of a larger area would be of interest but could be logistically difficult because of rock outcrops. Fencing of the single spring would be a simple task that could provide useful information. At the moment there is nothing really to suggest that it would be rapidly colonised by Phragmites. 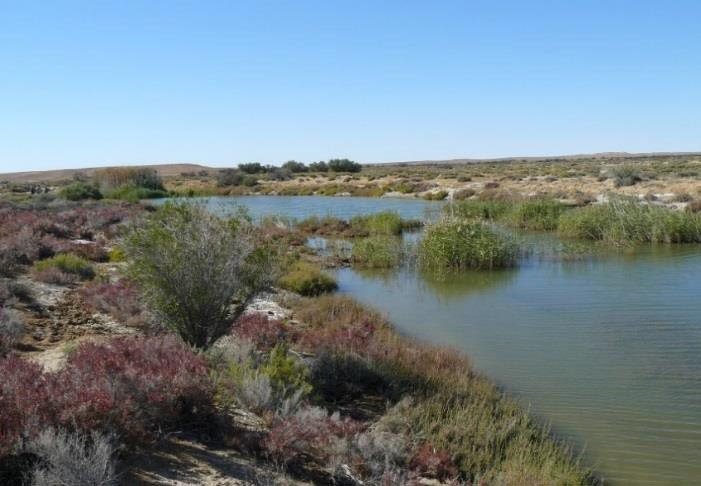 FOMS’ observations at Hawker Springs support the hypothesis that grazing impacts are most pronounced at the outer springs of this large group, diminishing towards the centre of the group. 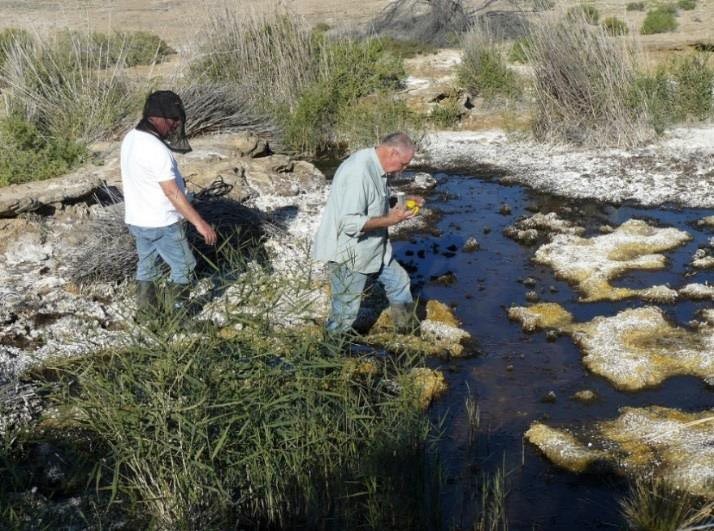 A more rigorous research project at Hawker Springs would provide useful information about grazing impacts. This could be promoted as a University research project. FOMS believes that fencing of some of the springs at Fanny Springs should be considered further. This is a fairly linear group of about eight springs and we believe it may be instructive to fence up to half of the springs (within one enclosure) and leave the rest open to grazing. It has been suggested that fencing of some of Fanny Springs is not a priority as these are low-flow springs of limited interest. However, FOMS believes this should be considered further. The terrain and linear nature of this spring group means that this is an opportunity to fence on a larger scale than most other fenced springs on pastoral lands and follow-up monitoring could provide useful information for the project. The springs at Finniss Springs have been free of significant grazing pressure for twenty years or more. They will undoubtedly be good reference areas but may also be suitable for active management trials. FOMS proposes that there should be joint inspections at Finniss Springs, as soon as possible and before the end of 2014, to consider the merit of Finniss Springs for trials and/or as reference sites. An important hypothesis emerging in this work revolves very much around elevated nutrient levels created by cattle access. A good deal of chemical analytical work has been undertaken in the mound springs over the years and this should be reviewed as part of testing the above hypothesis. In addition, a systematic program of nutrient testing is needed in springs with a range of grazing (and non-grazing) histories to help assess the links between cattle grazing, elevated nutrient levels and Phragmites incidence and abundance. FOMS will continue to work closely with DEWNR personnel and others on this project. The next twelve months should prove very interesting as field trials get under way and FOMS volunteers are likely to play an active part in assisting those trials.